I was 16 years old the first time I stepped into a research lab. I was in awe of the equipment, the chemical solutions, and the scientific books and notebooks that surrounded me. After taking science classes all my life, it was surreal to be in a place where real discoveries were being made! I met with the researcher who led the lab and she first described her journey to becoming a scientist. She spoke about different research projects that were being done and gave me a tour of the lab. At the end of it, she offered me a memento from my visit. 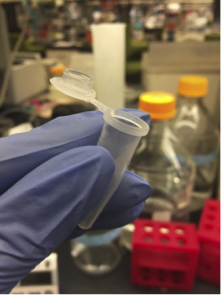 It was a small, plastic tube (called a microcentrifuge tube) used to store samples during experiments. At the time, I was worried about taking supplies that someone might need to use. 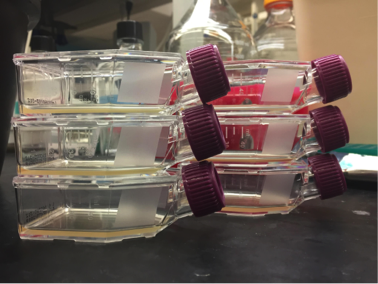 When I started working in a lab three years later, I learned these tubes were purchased in bags of 500! Since I enjoyed my first lab experience so much, I’d like to share a mini-tour of the lab I currently work in. In our lab, we study cells and learn about the DNA, RNA, and proteins that allows them to live. We grow cells taken from fruit flies in liquid “food”, called media, that provides nutrients the cells need to live outside a fruit fly’s body. To collect the cells, we pipette them out of the container they are grown in. Once we have collected the cells, we need to break them open to get the DNA, RNA, and proteins that are inside. We pull the cells through a narrow needle using a syringe. This movement breaks the cells apart. 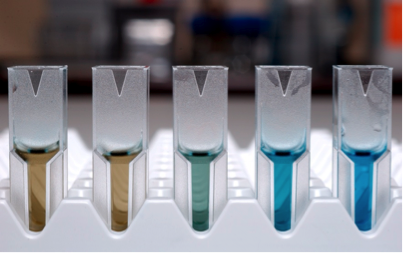 To determine how much protein we get from a sample of cells, we mix the protein we have with a chemical that changes color depending on how much protein is added. The solution is red-brown when there is little protein and turns blue when a large amount of protein is added. To prepare the proteins for use in experiments, they are collected at the bottom of microcentrifuge tubes using a centrifuge. The spinning forces the proteins to the bottom of the tube so that none of it is left on the sides. One way to learn about the proteins inside of cells is to separate the proteins by size. An electric current moves proteins through a gel, similar to a thin slice of Jello. This gel allows small proteins to move through quickly and reach the bottom first. Larger proteins have a more difficult time moving through the gel, so they stay near the top. 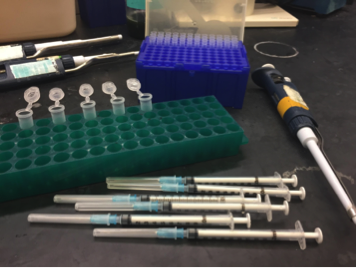 Since I first visited a lab when I was 16 years old, I have worked on several research projects, visited many labs, and used lots and lots of microcentrifuge tubes! In the process, I learned how to ask research questions and how to work closely with others to accomplish a goal. I hope you enjoyed this mini-tour of my lab. I encourage you to find a lab to visit on your own!